A Follow Spot: "Anonymous," the Movie. Will I or Won't I? Just for the record, I think Shakespeare wrote his own plays. And I really, really think it's nonsense to suggest otherwise. But a movie called "Anonymous," from blockbuster director Roland Emmerich, opens on October 28th, and it casts the actual William Shakespeare, the glover's son from Stratford-upon-Avon, as a silly hooligan who fronted for the real writer, Edward de Vere, the Earl of Oxford. So, you know, Shakespeare was a nobody from Stratford who couldn't possibly have written these fabulous plays because he wasn't noble or aristocratic or educated enough, blah blah blah. The "Anonymous" trailer is already all over my television. And that gives me pause. Do I avoid it like the plague, because I find the very idea odious and idiotic? Or do I pay my money and "review" (and therefore spend time on) something I hope dies a quick death? One of the blogs I follow (see column at right) has already dealt with the "Anonymous" issue far better than I ever could. 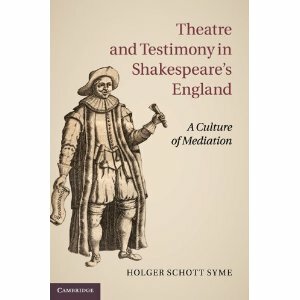 Holger Schott Syme, the author of that blog, is an associate professor who teaches Shakespeare (and other topics) at the University of Toronto, where he also chairs the Department of English and Drama at the Mississauga campus. In a blog post from September 19th called "People Being Stupid About Shakespeare," Syme dissects the movie quite neatly, pointing out all the ways it is even more idiotic than you might expect from an "authorship" movie. I will wait while you go and read that post. Well done, yes? But Syme goes on, on October 18th, to suggest that it is not acceptable to just ignore the "Anonymous" ideas floating around out there. In "Enough Already," Syme argues that meeting Anti-Stratfordians with either boredom or rage isn't going to make them go away. He talks about Sony pictures encouraging high school teachers to use "Anonymous" in classes as a "quasi-textbook" and offers a poster of a German production of "Macbeth" that says the play was written by Edward de Vere, "alias William Shakespeare." Seriously. On the poster! So there's my dilemma again. Should I ignore a movie that is guaranteed to set my teeth on edge? Or see it and then write about it, even though I knew I would hate it before I went? I think I am just going to stay out of it and direct you to keep reading Holger Schott Syme. I have Oxfordian friends and because I expect they will be talking about this a lot, I might have to see it. I'll be Over There around the time of its Stateside release, so very likely we won't get round to it till it's on DVD. I think I'm going to have big big problems with the Elizabeth I aspects of the story. Or rather, Big Problems with capital BP. Not sure I will willingly suspend belief. Yeah, I agree that the Elizabeth I problems are huge and weird and just unnecessary. It's one thing to grind your Oxfordian ax, but to bring Eliz into the mess... Just silly. Best of luck if you see the movie! I may wear sunglasses and sneak in. One of my favorite books ever is "The Shakespearean CIphers Examined," by William and Elizebeth [sic] Friedman, professional cryptographers (they met when both worked for a nutty lady who believed that Bacon had enchiphered secret messages into the First Folio and got financing for large-scale research teams, and they were at the top level of the US's WWII crytographic work). In the book, they very dispassionately and fairly look at every effort to find coded messages in Shakespeare's work and disprove each of them on the merits -- show that the method is no method at all, or that anything could be "proven" using it, or that the results were clearly fudged. Great stuff.